This book serves as a companion guide to Leanne's bestselling book The Keto Diet (Victory Belt, 2017). With the impressive sales of that first book, she quickly became a top keto influencer and the go-to resource for those looking to transition to and learn more about the keto diet. While sales of The Keto Diet remain strong and Leanne's momentum continues to grow, she feels there is a need for additional recipes to complement the original book. Each recipe is an extension of the foundation she laid in her breakout title. The Keto Diet Cookbook features recipes laid out in a new format based on meal size and calorie count, enabling readers to further customise the diet to their individual needs and health concerns. Start reading The Keto Diet Cookbook: 140+ Flexible Meals for Every Day on your Kindle in under a minute. "Leanne is a pioneer when it comes to communicating the essence of a quality ketogenic diet and loving it every step of the way. The Keto Diet Cookbook's recipes are superb. What I love most, though, is that the book goes beyond the food and the info, and it refreshingly brings about the winning mindset that is truly the most important ingredient." Leanne Vogel is a nutrition educator and the founder of Happy Keto Body™, the ultimate 12-week online keto program for fat-burning women. Leanne has gained worldwide recognition for her unique “no-limits,” Paleo-friendly approach to the keto lifestyle and is the go-to resource for people looking to achieve health, happiness, and body confidence through a high-fat, low-carb keto diet. Leanne found keto through her personal struggles with health and weight loss. It transformed her life, and she immediately set out on a path to help others find the same success. With her top-10 health podcast, The Keto Diet,she provides daily motivation, tips, and advice for getting started with keto and overcoming hurdles, along with maintenance plans. This cook book came only two days ago but I have already made one recipe. She inspired me to go outside my comfort zone a cook liver for the first time in my life! This morning I sat down with the awesome meal planning section of the book and plotted out our next week. I really love that most of the meals in this book are complete and balanced so I didn't have to spend time patching together recipes or adding things. I also appreciate how detailed every recipe is about storage, reheating instructions, alternatives based on your food sensitivities or allergies. Leanne seriously took the time to make this cookbook for EVERYONE in the Keto community. My only request is for future books would be “treats” with no alternative sweeteners at all as I'm trying to wean myself off them, but that’s a tall order. Oh, and while this book is more focused recipes and meal planning than her other books, it still had a very good little section on eating for your hormones and cycle. It’s very easy to understand and I look forward to referencing it and trying it out. 5.0 out of 5 starsThank you so much, Leanne. I’m in awe! Thank you so much Leanne for making this book. I have your previous book that taught me all about whole food keto and introduced me to dairy-free living. I not only love this new paperback, but I always return to your first paperback book when I feel overwhelmed and need to just relax. Leanne is more than an author, she simply has been through all things in the health and fitness space and speaks from her heart and wants to help women to the best of her ability. Keto has helped me come off my antidepressant medication I was told I would not be able to come off of and with Leanne and her podcast, it makes her paperbacks and information all come together. I feel like I know Leanne personally through her amazing work she’s done for me and the keto space for women. She is truly teaching me how to love and respect my body and with her new paperback she does an amazing job color coding and providing very easy meal plans for individual or the whole family. She truly took into consideration her follower’s voices and did just that to provide the best Keto Lifestyle for everyone. I love everything Leanne speaks about because it is all so relatable. Please just do yourself a favor and invest in her new Keto Diet Cookbook. You simply won’t regret it and you’ll instantly fall in love with the easy process of amazing foods and sustainability of a healthful way of life. Thank you Leanne for your work and continuous hard work. My morning commute will never be the same without listening to your podcasts to and from work every morning! Thank you so much for opening my eyes to a whole different life I was restricting myself from. 5.0 out of 5 starsSo much more than a Cookbook! This book is for anyone intersted in Keto. If you are new to the Keto way of life, have been keto for years, or struggle with finding recipes that fit your needs, I highly recommend you purchasing 'The Keto Diet Cookbook' by Leanne Vogel. It is filled with more than just recipes. She packed it full of information to help guide you on your ketogenic journey. The information Leanne provides is done in a way that is easy to understand and isn't overwhelming. Her meal planning section is genius! By categorizing meals based on the caloric intake, and grouping them together, is game changing! The layout of the book makes it easy to find what you are looking for. For those of us that have to modify recipes due to allergies and/or due to an autoimmune disease, she provides you with the information needed to make the modification, specific to your needs. I am excited to cook my way through this cookbook. 5.0 out of 5 starsShe’s done it again, Folks! Yay! I have most of her books and listen to her podcast regularly. I was worried the book would have nothing new to offer but What! Whoah! Seriiiooouusly? Yeah, she did it again. New info, meticulously thoughtful tools/charts and fun new recipes. 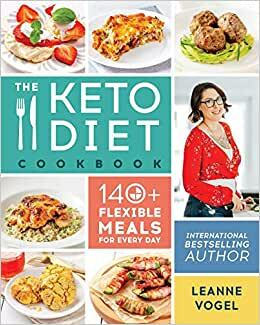 I went through every page of it on the first day it was available because if you are Keto obessesed like me, it just doesn’t get better than Leanne’s material. Thank you and well done! Where do I even start? This book has pretty much everything you need to know to go keto, so it's perfect for the newbie as well as the experienced keto-er. It has beautiful pictures of every recipe, because seriously, who wants a cookbook without pictures? It has so many options - how to make it dairy free, nightshade free, etc. You can look up recipes by key ingredients, (e.g. BACON) and see every recipe that has that ingredient. Leanne talks about macros and hormones and how and why and like I said, pretty much everything you want to know. This is hands down my new favorite keto cookbook - (sorry every other author).